Undoubtedly, the worst fire in Midddleborough's long history was the fire of mid-December, 1974, which burned for nearly four days, and which consumed three large factory buildings in the process. The fire began in the early morning hours of Friday, December 13, 1974, in the abandoned George E. Keith shoe factory on Sumner Avenue on Middleborough's West Side. The factory had been constructed in 1905 as a result of efforts by a group of concerned citizens intent upon luring new manufacturing interests to Town. 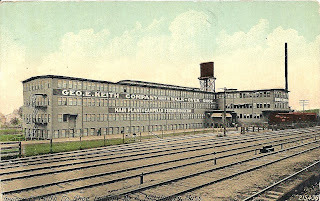 Following the post-World War II decline in New England shoe manufacturing, the Keith factory was utilized as a warehouse by the Plymouth Shoe Company which had purchased the building. Winthrop-Atkins for a time also used a portion of the factory for storage purposes. Eventually, in 1972, the Town took the property for $24,000 in unpaid taxes with the Middleboro Development and Industrial Corporation taking ultimate ownership. Though the Corporation did see some interest expressed in the building by outside manufacturing concerns, it remained unoccupied. Meanwhile, the factory's windows remained unboarded, leaving it a target for vandalism and, on the night of December 13, arson. The fire originated in the four-story factory and quickly spread through its 300 foot length. Within minutes, the Keith factory was a raging inferno. Despite the windless night, the fire soon crossed the railroad tracks towards Cambridge Street, prompting a general alarm call which was responded to by every piece of Middleborough equipment, as well as 14 surrounding communities. For miles around, a great orange glow could be seen in the sky. 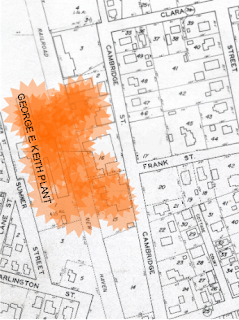 On Cambridge Street, two factories which stood directly across the railroad from the Keith plant were soon on fire. The old Lobl manufactory (ironically built to replace an earlier factory which had succumbed to fire in July, 1919) which then housed the Middleboro Plating Company was completely engulfed. The neighboring factory, known as the Alberts Shoe Company factory from the firm which had occupied it between 1933 and 1965, in 1974 housed Stav, Inc., a plastics recycling company, and it, too, was soon ablaze. With all three factories engulfed in flames, the focus of the nearly 200 firefighters present was preventing the conflagration from spreading further. A constant stream of water was kept on the oil tanks of the Standish Oil Company on Cambridge Street, and residences along Cambridge Street were continually hosed down to prevent their catching fire. Residences between Cambridge and Everett Streets were evacuated, as were houses along Lane Street, and the Fourth District Court on North Main Street was opened as a shelter. Nearly 3.25 million gallons of water were used in quenching the fire, at one point lowering the Barden Hill standpipe to a dangerously low level. Additionally, so much water was drawn from Nevertouch Pond that its level fell some eight inches in the course of Friday morning. By dawn Friday, the fire had been brought under control, but the process of extinquishing the smoldering rubble would continue for days. Poultry feed at G. D. Poultry on Cambridge Street continued to burn for days, as did the melted plastic from Stav, Inc. Four Cambridge Street businesses - Stav, Inc.; D & A Electroplating; Middleboro Printing Co.; and Middleboro Plating Corp. were completely destroyed, while a fifth - G. D. Poultry - was severely damaged. In the aftermath of the fire, the Board of Selectmen declared the neighborhood a disaster area, partly in order to make the five businesses destroyed or damaged in the blaze eligible for Small Business Administration loans for rebuilding. This postcard depicts the George E. Keith factory on Sumner Avenue in Middleborough sometime in the decade following its construction. 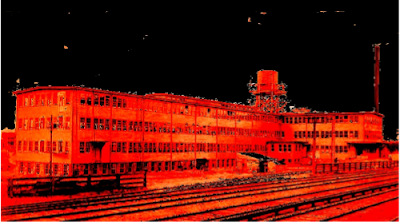 At the time the factory was destroyed in December, 1974, a second two-story ell stood between the main four-story block and the railroad line. The map shows the extent of the fire. Though the night was windless, the conflagration spread to the east side of the railroad line, destroying an additional two factory buildings. Lane Street as well as the blocks between Cambridge and Everett Streets were evacuated as a precaution.